- You can add Luxembourg but isn't mandatory. Il mio percorso è una rivisitazione del BinckBank Tour, trasformato in un Classics Tour, una corsa a tappe disputata sulle strade delle grandi classiche. 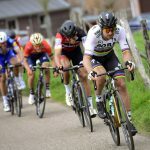 La prima tappa si disputa quindi sulle strade dell’Amstel Gold Race, la seconda è dedicata al vento che spesso le condiziona, la terza è sulle rotte della Freccia Vallone, la quarta su quella della Liegi, la quinta si conclude all’uscita di uno dei tratti più celebri della Roubaix e l’ultima è una cronometro con epilogo sul Muro di Grammont, tempio del Giro delle Fiandre. My path is a reinterpretation of the BinckBank Tour, transformed into a Classics Tour,a stage race disputed on the streets of the great classics. The first stage is then played on the streets of the Amstel Gold Race, the second is dedicated to the wind that often affects them, the third is on the routes of the Flèche Wallonne, the fourth on that of Liege, the fifth ends at the exit of one of the most famous features of Roubaix and the last is a stopwatch with epilogue on the Wall of Grammont, temple of the Tour of Flanders. - 4 countries visited: Belgium, Netherlands, Germany and Luxembourg. - Climbs: 23 4th Category, 10 3rd Category and 3 2nd Category. Yes, this is a prologue! An ITT is considered as a prologue when it's under 13 km. We start in the famous port of Antwerpen. This stage is globally flat, except a categorized climb in the last 30 km to decide the first KOM jersey. This stage is surely for sprinters. We're in Netherlands so riders should take care of wind. This stage is travelling the roads of Amstel Gold Race, with some new climbs like the Ingbererberg and Côte de Beusdael, in Belgium, and it finishes in Germany with the city of Aachen which is very close to belgian and dutch border. We're in Germany less than 5 km. This stage is climbing some famous climbs like Redoute or Stockeu, but new climbs are introduced in this stage like Col de Targnon or Montée du Paradis. This stage can be very interesting due to proximity of climbs in the last km's. The country of Luxembourg is very hilly, as we can see in this stage. Climbs can be very steep, like Rollingerberg or Beringerberg that I found myself. These climbs can be launchers for punchers. This is the longest stage of this BinckBank Tour. The cobbles aren't really hard but they can be with the last very exhausting days. The end of the stage with the cobbles is a little bit hilly so gaps may appear. Today for the last stage, we're on the roads of Ronde Van Vlaanderen, which are not enough exploited in real BinckBank Tour in my opinion, but I kept the traditional finish in middle part of Kapelmuur. This BBTour is 7 days long and contains 2 plain sprint stages, 1 time trial, 3 hilly stages and 1 stage with cobblestones. Stage 1 starts in the north of The Netherlands and finishes after 170km in Veenendaal. The Golden KM is 8,5 km before the finish and lays on a little hill. Stage 2 starts in Rhenen at the gates of the zoo 'Ouwehands Dierenpark'. The finish is in Belgium in Mechelen in front of the zoo 'Planckendael'. Just 165 km for this second flat stage. Stage 3 is a short time trial in the Dutch city Valkenswaard. Just under 15 km long. This is the first important day for the GC riders. Stage 4 is a mini-Amstel Gold Race. A lot of turning and little steep climbs in the Dutch Limburg province and Belgium. The finish lays on top of het Drielandenpunt (Three Countries Point) on the border of Belgium, The Netherlands and Germany. Stage 5 brings Luxemburg in this BinckBank Tour. 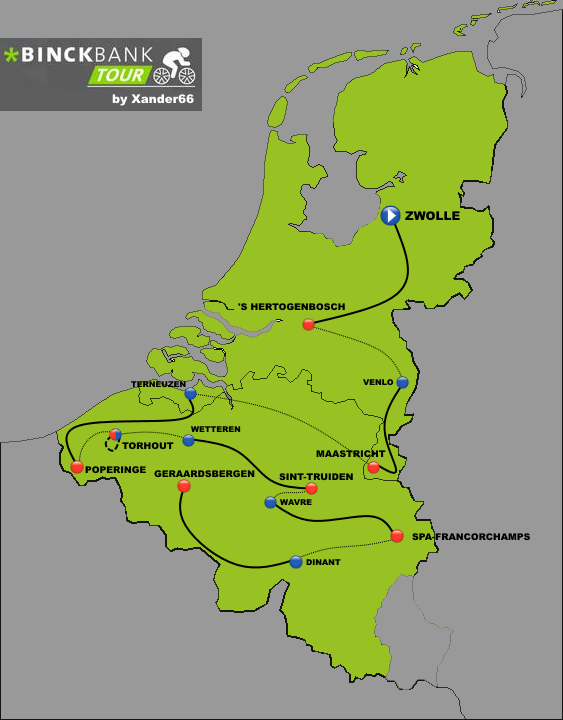 The initial purpose of the ENECO-tour was a stage race in the Benelux. So i took Luxemburg in my race. A difficult hilly race with finish in Wiltz. Stage 6 is a plain stage and brings us from Wiltz through the Arden-region to Perwez. It will not be a hilly race but its a cobbled stone race at the end. Important and difficult for some GC-riders it hink. Stage 7 is the well know stage to Geraardsbergen with finish on the Muur. The final day will bring a spectacular race. I hope you all like my version. Flat stage, nothing special about it I guess. Probably a sprint with the big group at the end. Bit of an Amstel-type stage, but I wouldn't expect to many gaps between riders here as it is only the second stage. Small group will probably sprint for the stage win in Maastricht. Another flat stage you would think... Well, it isn't. This stage will be all about the wind. A passage through De Moeren (known from Gent-Wevelgem and The Panne) will most likely give a great opportunity for echelons. A stage where you can definitely lose the Binckbank Tour. A time-trial in and around the city of Torhout. Mostly flat, but a couple of uphill streets which sadly aren't depicted very well in the profile, so the track is a bit harder than it seems. I would've liked to make this time trial a bit longer, but the contest rules said only 15km so... Here it is. First chance after the ITT to close the gap if you've already lost some time. The cobble sections are an opportunity, but again I don't expect anyone to be able to ensure the overall victory already in this stage. After today things will be a lot clearer, I only expect a handful of riders still in the running for the overal win after this Ardennes stage. Not the most famous climbs (only the Mur de Huy is a real name in cycling) but they will surely be hard enough to make the difference. The finish line will be on top of the famous Raidillon corner of the F1-Circuit of Spa-Francorchamps. To make this stage more explosive, I decided to remove the laps in Geraardsbergen. There will only be one passage over the Muur and Bosberg before the riders arrive at the finish line. The first part of the stage, the road to Geraardsbergen, will be harder than the real Binckbank Tour, with the inclusion of several climbs from the spring classics such as de Kwaremont and Kluisberg. Last edited by Xander66 on 21/08/2018, 11:06, edited 1 time in total. My Binckbanck Tour is a real hard one. To begin with two flat possibly windy stages. Third stage is a short ITT, and then we have four stages for the classics riders. The race starts in Groningen in the north of the Netherlands. The first stage takes the riders from there to Hoorn. With a passage over the Houtribdijk in the final 20km. This is a flat stage but the wind could keep the sprinters from the victory. The second stage takes the riders from Spijkenisse to Goes. This should be a spectacular stage with 100% chance for echelons and time gaps. The third stage is a short ITT in Oss. The fourth stage is the first hilly one. The race goes to the south of The Netherlands where some climbs of the Amstel Gold Race are in the parcours. After the Golden Km on the Cauberg there is still 20km to go towards the finish line in Lanaken. So this could be a small group that goes to the finish or a reduced bunch that comes back together. The fifth stage is the queen stage through the Ardennes. With start in Verviers and finish on the legendary F1 circuit of Spa-Francorchamps. A lot of steep climbs in the final, this is a mini version of Liege-Bastogne-Liege. The pure climbers must take their time here for the next stages. The sixth stage is a cobbled one. There are no excepional hard cobbled sections but its uphill and downhill, narrow roads, ... The finish is shortly after a cobbled section so small time gaps are expected. The final stage takes the riders from Binche to Geraardbergen, with the classic finish on the Vesten. But the road towards Geraardsbergen is quite harder than a normal Binckbanck Tour. This stages had a first part of cobbled climbs before going tot he only local lap. This should make the race harder, and with the koppenberg in it there should be some gaps with a long distance to go. Also after the Taaienberg the race keeps going on narrow roads wich makes it harder to regroup and make a chase. If they want to, the riders can make a it really hard stage. This is my first on this forum, so it is quite logical that it is also my very first attempt to design a stage race. I tried to stay as close as possible to the current BinckBankTour-format. That means that there is always a start-loop and a finish-loop, each containing the Primus-checkpoint. But, instead of the very weak route of this year, I tried to make it harder, without going over the top. As requested by the breifing, I tried to incorporate as much specifics of the countries as I could. I hope you like it! 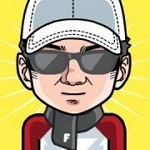 - 2 stages with cobbles, 3 stages with loads of unknown hills, 1 windy stage but not the classic one. In this stage, it is all about the wind. As we will cross two long dikes, the rides will be exposed to the winds almost all day. In combination with the local lap, which has a different orientation then the dikes, there will always be a place where the wind will be good for echelons! The cobbles around Emmen were deemed to dangerous for the Vuelta, but of course they form no problem for our classics-riders . Starting in Heereveen, rides will pass the TT-circuit of Assen before starting on the first of 11 cobbled sectors. In total the riders will face 28,4 km of typic "Drenthse Flinten" before finishing in Emmen. Today, the riders will pass the National Park Hoge Veluwe. But there won't be much time to look around for wild deers or bores. Instead the will need to climb some hills. Yes, there are also hills in the middle of The Netherlands. Once passed Arnhem, rides will arrive in Nijmegen for 2 local laps. In those laps, the sprinters need to survive some more little hills in order to be able to sprint on the Waalkaai, next to the majestic river Waal. The startloop of this lap circles around the only National Park in Belgium, Hoge Kempen. After some flat kilometers we finally arrive in the Ardennes. Well, not really. Instead we will stay on the east side of Liège and we will use the river Vesdre as our guide. And that won't dissapoint. The Vesdre gives us short but very steep hills, some of them maxing 20%. This is a stage for the lightweight-climbers. (Unfortunately the elevation map is not giving full credit to this stage). The timetrial takes place around Luxembourg. The start will be near the palace and soon we will leave the city for long stretches of straight road. Totally suited for the pure timetrial-specialists. After the intermediate point, we head back south to finish on the Place de la Constution. There, the podium will be placed next to the spectacular ravine. With today's stage, we will discover the deep south of Belgium. Almost no professional race takes place here and that is a shame. After a day in the woods, we will finish at the medieval castle of Bouillon. This is a hard stage, with lots of unknown climbs. The riders won't have time to stop for a beer at the abbey of Orval! (Unfortunately the elevation map is not giving full credit to this stage).